Omani police used tear gas to disperse demonstrators who blocked a port in the northern part of the Gulf Arab state, activists said on Thursday, saying they were protesting against industrial pollution that was a risk to health. The protests come less than a month after Sultan Qaboos, Oman’s ruler, pardoned those jailed for taking part in the 2011 anti-government protests, in a gesture to citizens worried about unemployment and inadequate pay. Oman was shaken by demonstrations in 2011, following the outbreak of Arab Spring protests in North Africa. 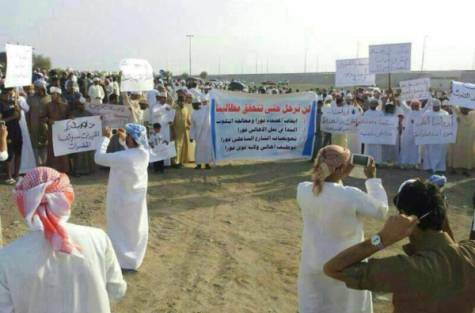 Activists posted pictures of dozens of men and women in traditional Omani clothes standing with placards on a dirt road they said was outside the Sohar port in northern Oman. “For years, we have been breathing poison. Have mercy on us, we want clean air,” read one poster carried by a young man wearing a surgical mask. One activist told Reuters from the scene that police had begun using tear gas to disperse the demonstrators. Activists later posted pictures of white clouds of what they said was tear gas used by police, and photos of demonstrators running away from the scene. They said Talib al-Mamari, a member of the country’s consultative Shura council, was among several people slightly injured when police broke up the protest outside Sohar port. A police spokesman declined to comment on the incident. Omanis say they have long complained against the pollution emanating from the industrial zone at the port. The government has promised to help residents living nearby to relocate, but have yet to take any action.